← You’re sure you meant to say that? 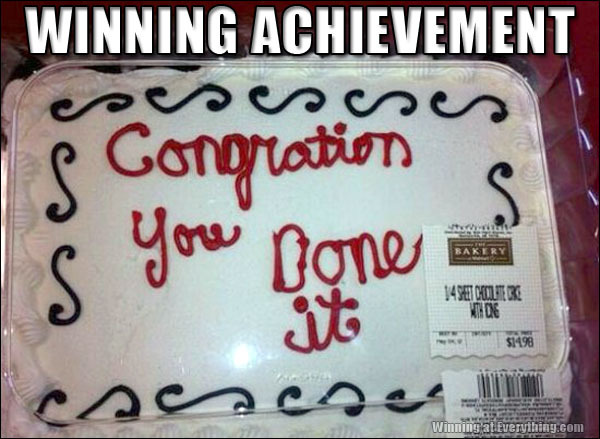 Can’t determine if this cake celebrates someone beating diabeetus or being the first in the family to obtain a G.E.D. Yes, congrations on oll you’re complshments! Twas a diffult road, but I push true! I take it this cake was served at the party for the little pre-school graduate with the name full of KHs and Ys? One of the local Kay Roget’s (I’ll let you figure out what store I’m talkin’ about) is infamous for this type of thing. We purchased no less than three work cakes from them over 5 years that had such grammatical errors. Even when we gave them written instructions. I really hope this is just someone’s dad thinking he’s funny.